Over the last several years, the demand has grown rapidly for multi-room music in both homes and businesses. We can help you listen to different music in different rooms at different volumes all from one, easy to use system. Press Play offers a variety of multi-room music packages designed to meet your budget and deliver crystal-clear sound throughout your home or business. Our systems allow listeners to spend more time relaxing, and less time hassling with complicated stereo systems. Regardless of the type of music system you choose, Press Play takes aesthetics and design very seriously. 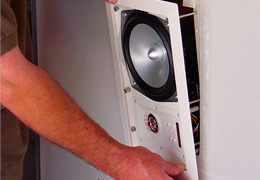 We aim to conceal all speakers, without compromising the quality of the acoustics.